Shame on me I was doing so well, dear sweet blog I have neglected you again. I haven't had much in the way of work that I would really post though so I guess it wasn't totally due to my laziness. Had some personal stuff to deal with towards the end of last month and this month so I've been trying to get back on track with work, life etc. But enough of that lets get to the doodling. I have been making some more crafty bits and looking into different work processes, I had my work accepted at PAD Gallery in Preston too, so the boy and I took the train to Preston town to drop the work off today. 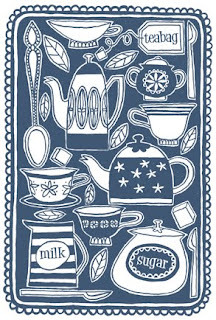 One of the new things is a teatime greetings card. I don't have pictures of the finished ones because I made 6 for the shop but forgot to take pictures of them first. But now its, TIME FOR TEA!